Philip is running the London Marathon for Attach-a-Leg Grenada. Please make a donation here. 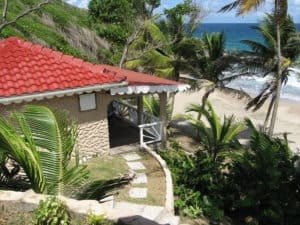 Petite Anse Hotel is a small beachfront boutique hotel in Grenada set within five acres of lush tropical gardens. Leave your stressful working life behind and enter a refreshing haven that is laid-back and friendly. We’ll serve you good food and great drinks and you’ll feel so at home that you won’t want to leave. We’ve got 11 cottages, 2 hotel rooms, plenty of smiles and an easygoing atmosphere. There’s a swimming pool, a palm-studded beach, restaurant and bar. We’ve also got a fully equipped conference meeting room space that can be used for yoga or other retreats. Every one of our private and romantic accommodation choices comes with a hammock so that you can enjoy the stunning ocean view of the Grenadines as you relax – cold drink in one hand and book in the other. The welcome is warm and the cocktails are heavenly. We can collect you from the airport, offer car hire, fast wifi and a variety of tours and activities. We also have a self-catering cottage option just up the road. Whether it’s just the two of you or an extravagant week-long party, we guarantee that your wedding will be effortless, unique and most importantly, unforgettable. We can host up to 100 guests for a seated meal or more if standing. Contact our wedding planner. Our guests are typically solos, couples or small groups seeking a tropical escape in Grenada. We use produce from our own fruit, vegetable and kitchen gardens to create our menus. If you let us know of any dietary needs, we will do our best to keep you eating right for you. BBQ lunch EVERY Sunday after our guided Sunday walk. We look forward to welcoming you to our own piece of paradise as one of the top-rated Grenada boutique hotels on TripAdvisor. If you have any questions, please don’t hesitate to contact us.